For other uses, see Hypnos (disambiguation). In Greek mythology, Hypnos (/ˈhɪpnɒs/; Greek: Ὕπνος, "sleep") is the personification of sleep; the Roman equivalent is known as Somnus. His name is the origin of the word hypnosis. Hypnos is the son of Nyx ("The Night") and Erebus ("The Darkness"). His brother is Thanatos ("Death"). Both siblings live in the underworld (Hades) or in Erebus, another valley of the Greek underworld. According to rumors, Hypnos lived in a big cave, which the river Lethe ("Forgetfulness") comes from and where night and day meet. His bed is made of ebony, on the entrance of the cave grow a number of poppies and other hypnotic plants. No light and no sound would ever enter his grotto. According to Homer, he lives on the island Lemnos, which later on has been claimed to be his very own dream-island. He is said to be a calm and gentle god, as he helps humans in need and, due to their sleep, owns half of their lives. 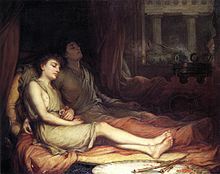 Hypnos lived next to his twin brother, Thanatos (Θάνατος, "death personified") in the underworld. Hypnos' mother was Nyx (Νύξ, "Night"), the deity of Night, and his father was Erebus, the deity of Darkness. Nyx was a dreadful and powerful goddess, and even Zeus feared to enter her realm. His wife, Pasithea, was one of the youngest of the Graces and was promised to him by Hera, who is the goddess of marriage and birth. Pasithea is the deity of hallucination or relaxation. Hypnos and Thanatos carrying the body of Sarpedon from the battlefield of Troy; detail from an Attic white-ground lekythos, ca. 440 BC. Hypnos used his powers to trick Zeus. Hypnos was able to trick him and help the Danaans win the Trojan war. During the war, Hera loathed her brother and husband, Zeus, so she devised a plot to trick him. She decided that in order to trick him she needed to make him so enamoured with her that he would fall for the trick. So she washed herself with ambrosia and anointed herself with oil, made especially for her to make herself impossible to resist for Zeus. She wove flowers through her hair, put on three brilliant pendants for earrings, and donned a wondrous robe. She then called for Aphrodite, the goddess of love, and asked her for a charm that would ensure that her trick would not fail. In order to procure the charm, however, she lied to Aphrodite because they sided on opposites sides of the war. She told Aphrodite that she wanted the charm to help herself and Zeus stop fighting. Aphrodite willingly agreed. Hera was almost ready to trick Zeus, but she needed the help of Hypnos, who had tricked Zeus once before. Hera called on Hypnos and asked him to help her by putting Zeus to sleep. Hypnos was reluctant because the last time he had put the god to sleep, he was furious when he awoke. It was Hera who had asked him to trick Zeus the first time as well. She was furious that Heracles, Zeus' son, sacked the city of the Trojans. So she had Hypnos put Zeus to sleep, and set blasts of angry winds upon the sea while Heracles was still sailing home. When Zeus awoke he was furious and went on a rampage looking for Hypnos. Hypnos managed to avoid Zeus by hiding with his mother, Nyx. This made Hypnos reluctant to accept Hera's proposal and help her trick Zeus again. Hera first offered him a beautiful golden seat that can never fall apart and a footstool to go with it. He refused this first offer, remembering the last time he tricked Zeus. Hera finally got him to agree by promising that he would be married to Pasithea, one of the youngest Graces, whom he had always wanted to marry. Hypnos made her swear by the river Styx and call on gods of the underworld to be witnesses so that he would be ensured that he would marry Pasithea. Hera went to see Zeus on Gargarus, the topmost peak of Mount Ida. Zeus was extremely taken by her and suspected nothing as Hypnos was shrouded in a thick mist and hidden upon a pine tree that was close to where Hera and Zeus were talking. Zeus asked Hera what she was doing there and why she had come from Olympus, and she told him the same lie she told Aphrodite. She told him that she wanted to go help her parent stop quarrelling and she stopped there to consult him because she didn't want to go without his knowledge and have him be angry with her when he found out. Zeus said that she could go any time, and that she should postpone her visit and stay there with him so they could enjoy each other's company. He told her that he was never in love with anyone as much as he loved her at that moment. He took her in his embrace and Hypnos went to work putting him to sleep, with Hera in his arms. While this went on, Hypnos travelled to the ships of the Achaeans to tell Poseidon, God of the Sea, that he could now help the Danaans and give them a victory while Zeus was sleeping. This is where Hypnos leaves the story, leaving Poseidon eager to help the Danaans. Thanks to Hypnos helping to trick Zeus, the war changed its course to Hera's favour, and Zeus never found out that Hypnos had tricked him one more time. According to a passage in Deipnosophistae, the sophist and dithyrambic poet Licymnius of Chios tells a different tale about the Endymion myth, in which Hypnos, in awe of his beauty, causes him to sleep with his eyes open, so he can fully admire his face. Hypnos appears in numerous works of art, most of which are vases. 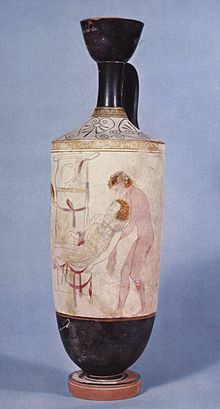 An example of one vase that Hypnos is featured on is called "Ariadne Abandoned by Theseus," which is part of the Museum of Fine Arts in Boston’s collection. In this vase, Hypnos is shown as a winged god dripping Lethean water upon the head of Ariadne as she sleeps. One of the most famous works of art featuring Hypnos is a bronze head of Hypnos himself, now kept in the British Museum in London. This bronze head has wings sprouting from his temples and the hair is elaborately arranged, some tying in knots and some hanging freely from his head. The English word "hypnosis" is derived from his name, referring to the fact that when hypnotized, a person is put into a sleep-like state (hypnos "sleep" + -osis "condition"). The class of medicines known as "hypnotics" which induce sleep also take their name from Hypnos. Additionally, the English word "insomnia" comes from the name of his Latin counterpart, Somnus. (in- "not" + somnus "sleep"), as well as a few less-common words such as "somnolent", meaning sleepy or tending to cause sleep and hypersomnia meaning excessive sleep, which can be caused by many conditions (known as secondary hypersomnia) or a rare sleep disorder causing excessive sleep with unknown cause, called Idiopathic Hypersomnia. Wikimedia Commons has media related to Hypnos. ^ ὕπνος. Liddell, Henry George; Scott, Robert; A Greek–English Lexicon at the Perseus Project. ^ James H. Mantinband. Concise Dictionary of Greek Literature. New York: Philosophical Library, 1962. ^ Wilhelm Vollmer: Wörterbuch der Mythologie aller Völker. Reprint-Verlag, Leipzig 2003 (new edition), ISBN 3826222008, page 263. ^ Scott C. Littleton: Gods, Goddesses, and Mythology, Volume 4. Marshall Cavendish/Tarrytown, New York (US) 2005, ISBN 076147563X, pages 474–476. ^ Homer. The Iliad. Trans. Robert Fagles. Ed. Bernard Knox. New York: Viking, 1990. ^ "Ancient Greek Art: Ariadne Abandoned by Theseus." Ancient Greek Art: Ariadne Abandoned by Theseus. N.p., n.d. Web. 15 Oct. 2013. ^ "Bronze Head of Hypnos." British Museum -. N.p., n.d. Web. 15 Oct. 2013. ^ "Hypnosis | Define Hypnosis at Dictionary.com". Dictionary.reference.com. Retrieved 2014-01-27. ^ "Insomnia | Define Insomnia at Dictionary.com". Dictionary.reference.com. Retrieved 2014-01-27. ^ "Somnolent". Dictionary.reference.com. Retrieved 2014-01-27. Look up Hypnos in Wiktionary, the free dictionary. 3D model of Bronze head of Hypnos via laser scan of a cast of British Museum's bronze.